Did Nikola Tesla moonlight as a swimming instructor? The photo is actually from 1898. And while the photo does bear a resemblance to the genius inventor, it's almost certainly not him. By 1898, Tesla was neck-deep in robotics, radio, and X-ray research. The man was also quite wealthy, enormously famous, and an obsessive tinkerer not known for taking leisurely swims. It seems highly unlikely that he took up a day job as a swimming instructor. But I wouldn't be surprised one bit if someone was working on a graphic novel with a similar plot at this precise moment. Was this the world's largest horse? 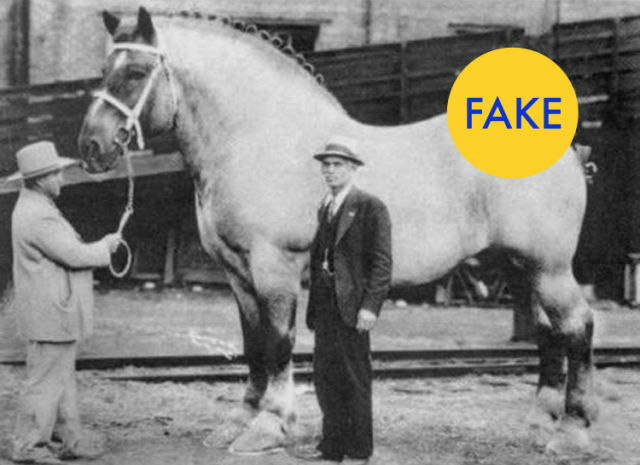 According to the error-riddled history site Retronaut, the photo above shows the largest horse ever recorded — a Belgian Draft called Brooklyn Supreme that lived from 1928 until its death in 1948. "Brookie" was 19.2 hands and 3,200 pounds. But the world's largest horse ever recorded was actually born in 1848 — a shire by the name of Mammoth (originally named Sampson at birth) that stood at 21.5 hands and weighed a whopping 3,360 pounds. Brookie was a huge horse, no doubt — but definitely not the largest ever recorded. Was this the world's first ambulance service? 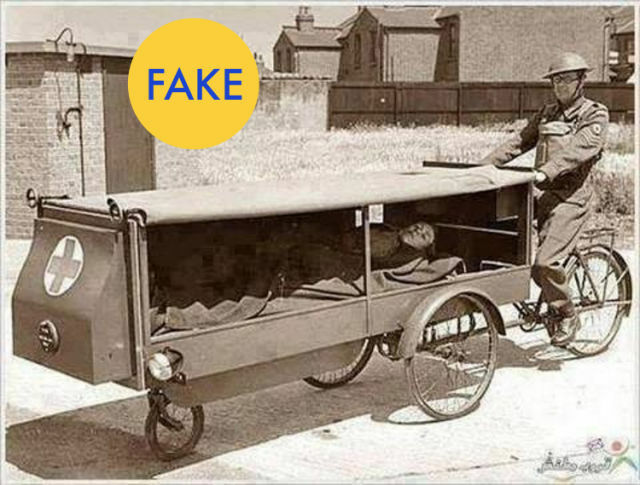 The caption often included with this photo claims that the bicycle-ambulance pictured above is the "world's first ambulance service." They don't include a date, but even if we conservatively estimate that this is from World War I, there's no way that the claim of "first" even comes close. Horse-drawn ambulances were used well before this photo was taken, including as recently as the Civil War. Was this bourbon actually aged by radiation? The label to this "21st-Century bourbon whiskey" from 1960 has been making the rounds lately on countless sites. Americans of the 1960s were certainly obsessed with all things nuclear. But did this bottle really contain whiskey aged 30 days by radiation? Nope. In reality, the bottle was a joke — a novelty sold at stores. 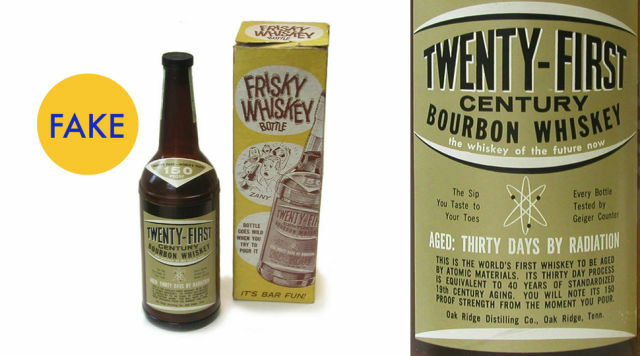 The "frisky whiskey" bottle was actually empty, except for a small battery-powered motor that was supposed to spook your party guests with its radioactive wobbling. 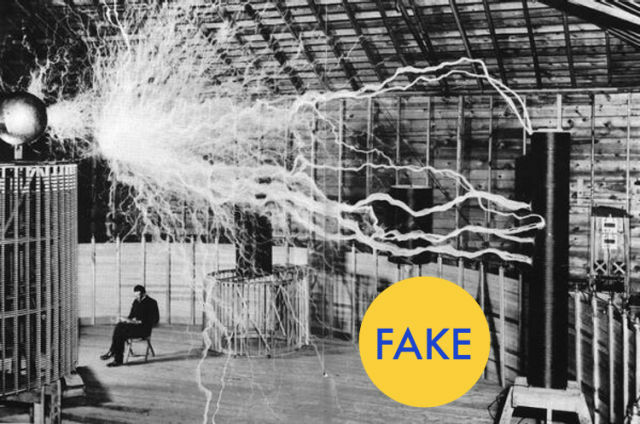 Is this a real photo of Nikola Tesla in his lab? This image of Nikola Tesla in his lab is kinda sorta real. But much like the Frank Hurley WWI photo we looked at a few weeks ago, this wasn't a single snapshot. It's a multiple-exposure photo that makes it look a bit more badass than it truly was. One of the stranger claims made by many Tesla boosters of today was that Tesla didn't know how to properly promote himself, and was thus forgotten by history unjustly. As W. Bernard Carlson explained fantastically in his new biography of Tesla (the best biography of Tesla, if you ask me) the man was a consummate performer who loved to wow audiences with illusions. And this composite photo is a perfect example of his flair for the dramatic. It's a fantastic photo. But it's not exactly what many claim it to be. 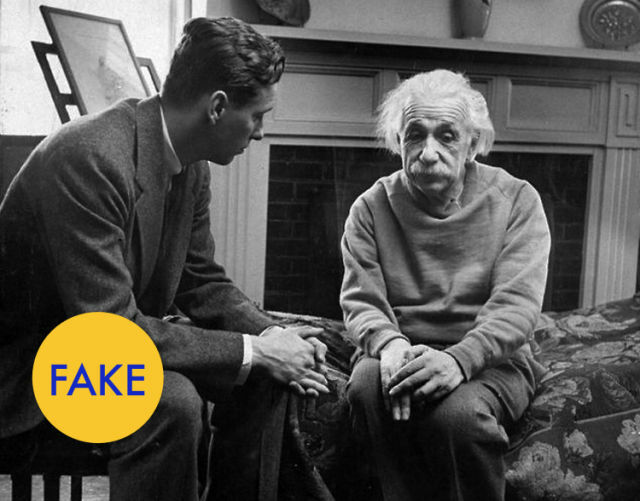 Is this Albert Einstein with his therapist? This 1948 photo actually shows Einstein visiting with Cord Meyer, Jr., the president of the United World Federalists, a group that advocated for one world government. According to Life magazine, they were discussing what Russia's attitude toward world government might be. Were the pyramids actually covered in snow? Egypt did indeed get snow recently. But this picture of the pyramids covered in snow isn't real. 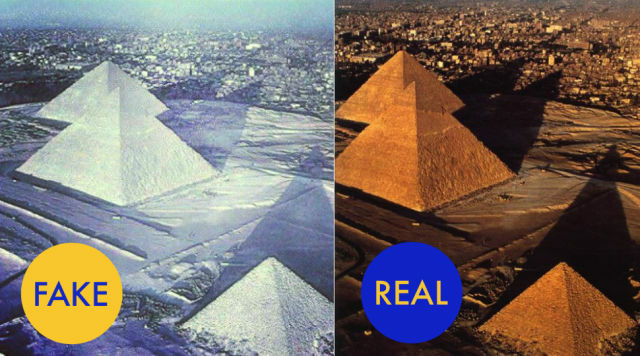 As Snopes notes, an older photo of the pyramids was doctored to create the impression that snow had blanketed the area. Was this really economy class air travel in the 1960s? We love to romanticize the "good old days" of air travel. And yes, some aspects of commercial flight used to be more luxurious. But here in the 21st century we often forget about the incredibly high prices, the slow speeds, and the horrible discrimination of yesterday's airlines. 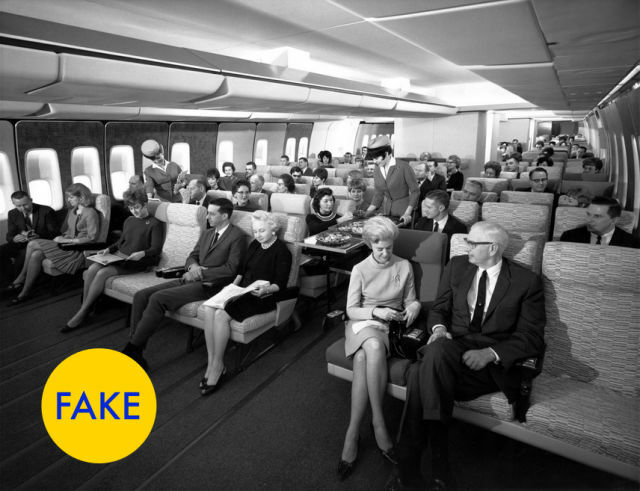 The photo above supposedly shows "Economy Class Seating on a Pan-Am 747," in the 1960s. The only problem? It's not a real plane. It's a mock-up produced by Boeing for what the 747 could have looked like. Yes, the future of air travel was supposed to be amazing. But in reality, it was never quite this amazing. Was this boy a real chimney sweep? The photo on the left supposedly shows a child chimney sweep from the turn of the 20th century. But if you're wondering why he's not wearing any shoes and the soot on his face looks like it was applied deliberately, I may have found the answer: the photo is from 1980. According to Getty Images the photo shows a four-year-old boy in London who's wearing a costume for a "fancy dress competition." 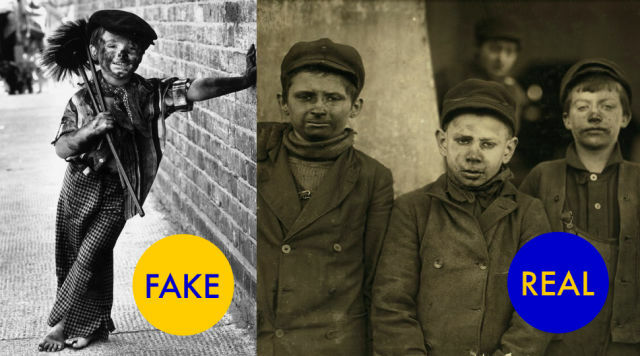 The photo on the right shows actual child laborers at the turn of the 20th century. You'll notice a distinct difference in how happy they are to be working. 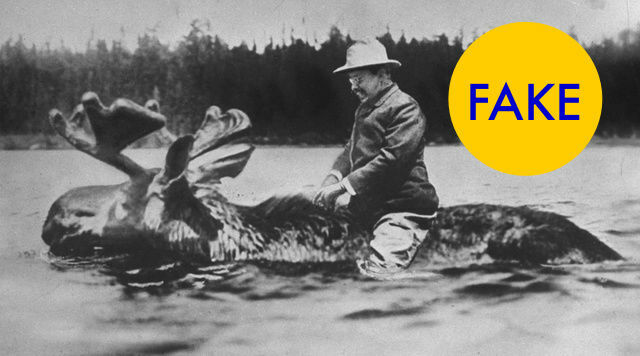 Did Teddy Roosevelt ever ride a moose? Everybody knows Teddy Roosevelt was a badass. Roosevelt epitomizes the American ideal of manliness so much that he's become a staple of 21st century pop culture. But did Teddy ever ride a moose? Sadly, no. The photo-composite above was part of a collage made by the press for the 1912 election. Roosevelt was running as a member of the Bull Moose Party, which explains why this pre-Photoshop fake was dreamt up. His opponents were also made to look like they were riding their party's mascots, with Taft on an elephant and Wilson perched atop a donkey. But we can't help but wonder what it might look like if Roosevelt were able to run today as a Libertarian. Their party mascot is a penguin. Now that would be a real test of bravery. Is this a 1954 prediction for the "home computer" of 2004? 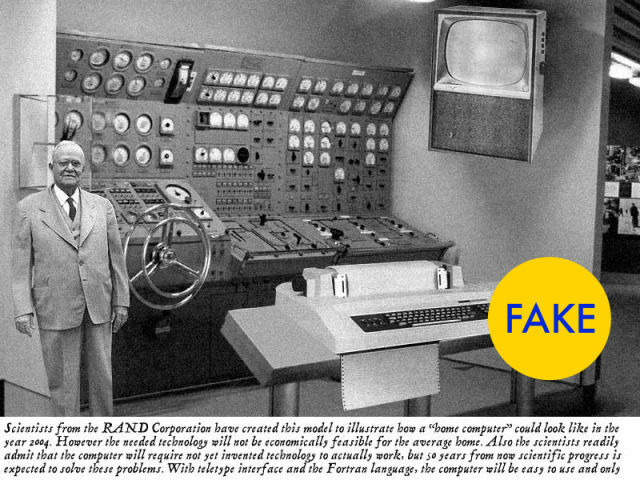 The image above is supposed to show a futuristic "home computer" designed by the RAND Corporation in 1954. And it'd be a wonderful artifact of retro-futurism. If it were true. The image was actually made during a Photoshop contest hosted by Fark back in 2004. And this fake has had a surprisingly long shelf life. Back when I first started the Paleofuture blog in 2007 I used to get sent this image from well-meaning tipsters nearly every week. These days most people know it's a fake, but you'll still see it pop up here and there. 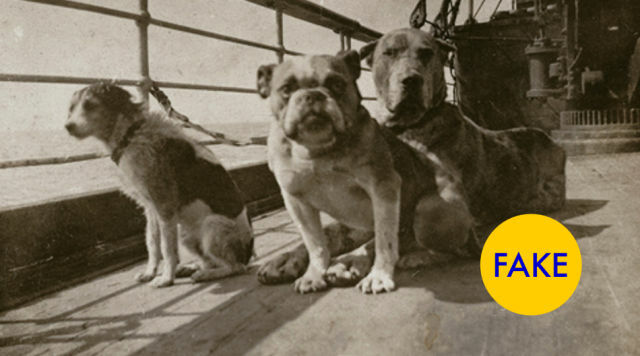 Did these three dogs survive the Titanic disaster? Yes, just three dogs are thought to have survived the sinking of the Titanic. But no, the three dogs pictured above weren't those dogs. "The dogs that survived were so small that it's doubtful anyone even realized they were being carried to the lifeboats," researcher Dr. J. Joseph Edgette told Yahoo News last year. Two Pomeranians and a Pekingese were indeed the only canine survivors among the 12 or so dogs on board. Sadly, the dogs pictured above didn't make it. Is this a robot librarian from the 1950s? At first glance, the photo on the left may look like another example of old fashioned automation—yesterday's great promise for the libraries of the future. But it's actually a Photoshop job, most likely concocted in the 21st century. 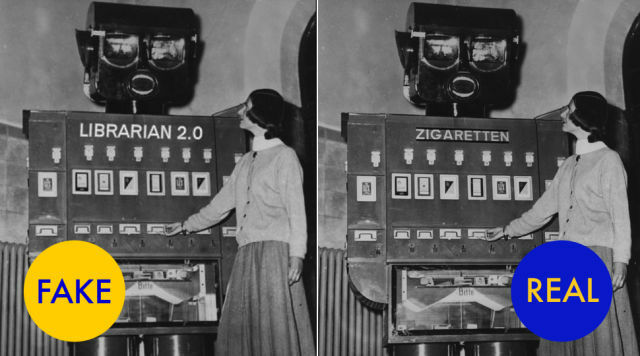 The photo actually shows a "robot" vending machine that dispensed cigarettes at the Berlin Zoo in 1955. Somehow, the truth behind this photo is even stranger than the fictionalized version. According to its caption at Getty Images: "The machine thanks customers on payment for the cigarettes, and at the same time gives road safety advice. Road accident scenes are projected in the robot's eyes." 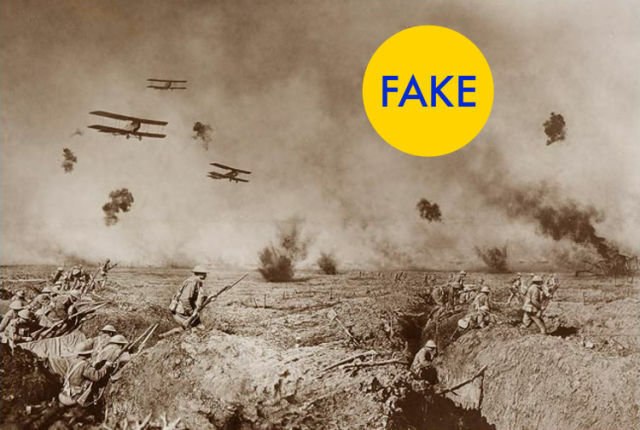 Is this a real photo of battle from World War I? Yes, technically this is a "real" photo from World War I. But if the composition looks a little too perfect for the middle of a battlefield, that's because it is. This photograph is actually a composite image. An Australian photographer by the name of Frank Hurley took the photo. Or, more accurately, photos. By combining different images—in this case the swooping airplanes above and the battlefield below—Hurley created photos that failed to represent what was "actually" happening during the course of the war. Hurley actually got into a fair bit of trouble for his images, and they remain incredibly controversial today. But he didn't just create composite images, he would also stage re-enactments and flat-out fabricate shots. Hurley defended his photographic creations, arguing that they represented the war far better than the limited technology of the time could ever capture. But nearly a century later, they're still being passed around as "real." Was this the first camera ever built? 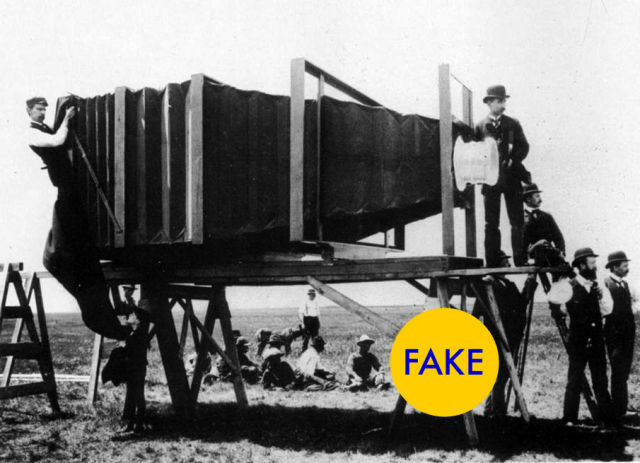 No, the 1900 photo above does not show the first camera ever built, which was supposedly photographed by the second camera ever built. Not even close. This may seem like a silly one to debunk, since anyone with even a basic knowledge of photography history knows that photo technology predates 1900. But with over 1,600 retweets on a single Twitter account alone, there are obviously plenty of people who want to believe it. The camera was indeed the largest camera ever built up until that time. But it was far from the first. 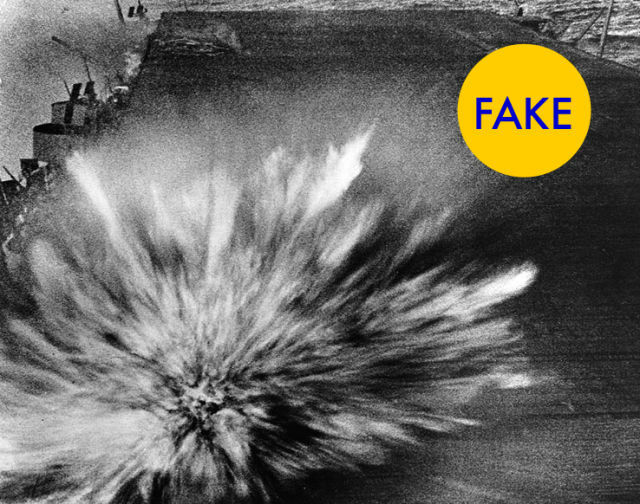 Did this bomb kill the man who took this photograph? Our last photo shows a Japanese bomb exploding on the flight deck of the USS Enterprise in 1942—a bomb that supposedly killed the photographer who took this shot. It didn't. Yes, this incredible shot was taken by a brave American photographer documenting the Battle of the Eastern Solomons on August 24, 1942. But this particular bomb, despite its impressive spray, did only minor damage, and the man who took the shot wasn't hurt. This inaccuracy, however, can't be blamed on the internet. Apparently the photo was inappropriately labeled when it was archived by the U.S. military. A photographer named Robert Frederic Read did die that day, along with 37 other men aboard the USS Enterprise. But he wasn't the man who took this particular photograph.